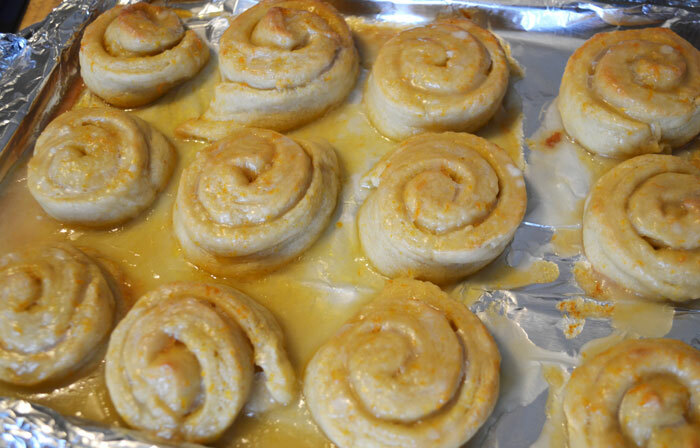 Based on Grandma’s Orange Rolls. Completes in around an hour and a half with a fair amount of downtime during rise. In a large bowl, dissolve yeast in water. Add the soymilk, shortening, sugar, salt, flax mixture and 3 cups flour. Beat until smooth. Stir in enough remaining flour to form a soft dough. Knead on a lightly floured surface for 6-8 minutes, then place in a greased bowl. Cover and let rise in a warm place for roughly 1 hour. Meanwhile, grate 1/2 large orange peel into small bowl, combine filling ingredients and set aside. Mix Glaze ingredients in a separate small bowl. While you continue to wait for the dough to rise, cover two medium or large baking pans with aluminum foil and grease lightly. Divide dough in half. Roll each piece into a 1/4″ thin, slightly oblong rectangle. Spread light, even coating of filling onto each rectangle and roll up each. Slice each log into around 10 rolls and space evenly on foil-covered trays. Drizzle excess or lost filling atop rolls. These can now begin baking where they will rise EVEN MORE! Bake at 375° for 25 minutes. Remove and spread glaze over warm rolls. One Response to "Speedy Vegan Orange Rolls"